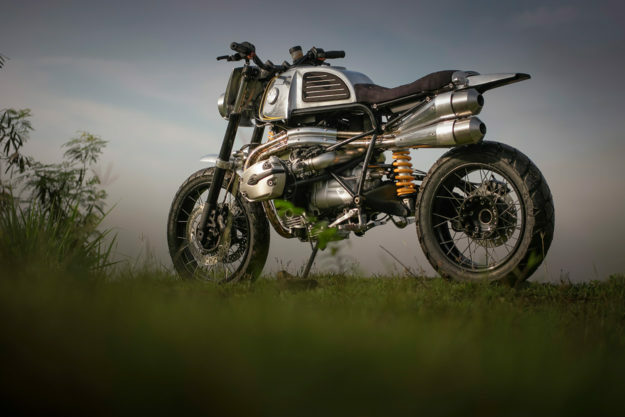 Why is the custom scene saturated with vintage R-series BMWs? We reckon it’s because they’re reliable and affordable, and builders love the Lego-like construction. The modern R 1200 GS is a rarity on the scene, though. It might be an icon of our times, but it’s also a big bike crammed with modern electronics and swathed in plastic. 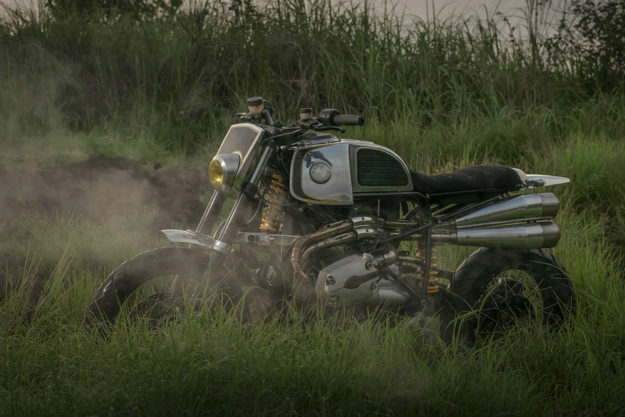 So you can imagine our surprise when Benjie Flipprboi of BCR Designs told us he’d modded a GS for a friend. 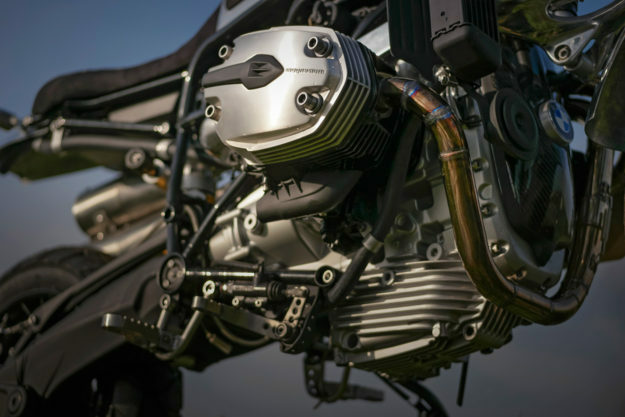 And when we saw the shots, we were stunned: This machine looks more like an alien life form than a motorcycle. 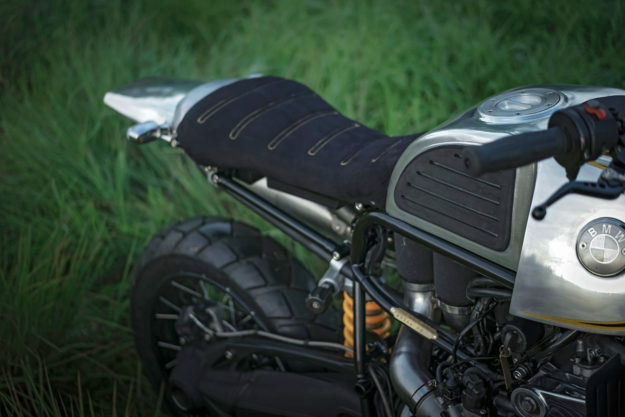 The client wanted a custom based on the Scrambler Ducati, but he’s 5’11” tall. The BCR team thought a bigger bike would be more suitable. 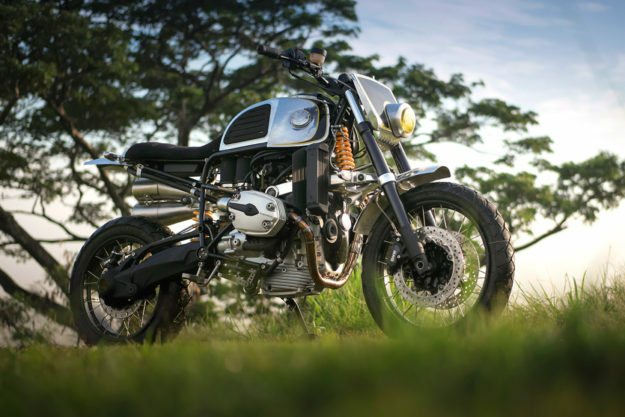 BCR’s client is more city rider than adventure nut, so the idea was to give the GS an urban vibe—but still retain some dual-sport sensibilities, just in case he had the urge to go off-piste. The donor is a 2005 model GS, which had 30,000 miles on the clock. It had been dropped a few too many times, but that didn’t matter. The motor, transmission, final drive and suspension were all good, and just about everything else was destined for the trash can. After the plastics were binned, the lines of the frame turned out to look awkward. So BCR lopped off and rebuilt the entire tail section. New frame rails were added up front too, running backwards from the steering neck and curving down to the mid section—reminiscent of 1970s BMW boxers. The extreme back-sweep of the stock handlebars also looked awkward with the nose fairing removed. 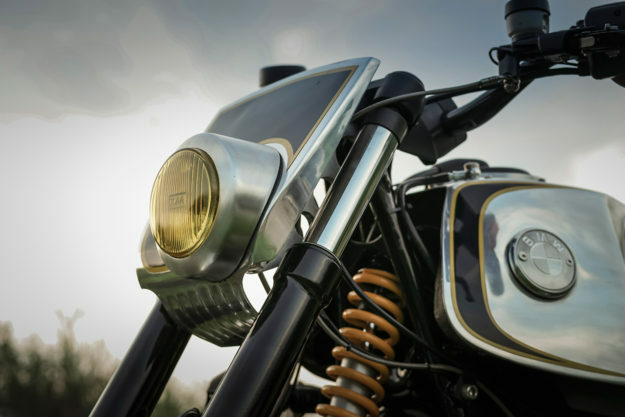 So BCR have fitted more aggressive low-rise bars from ProTaper, fabricating a metal plate to mount them closer to the rider. 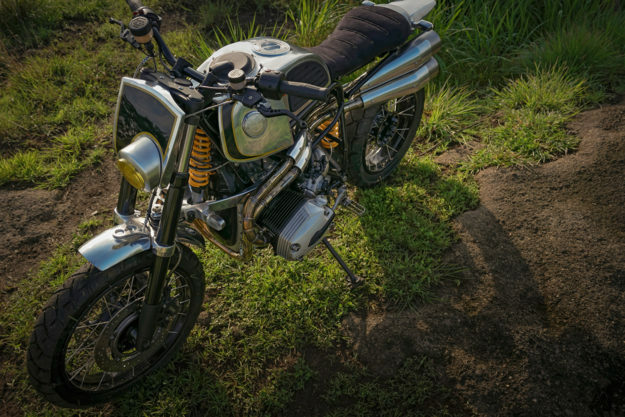 Right in front of the bars is an MX-inspired aluminum number board and headlight assembly. But the bottom triple clamp on the Telelever system is mounted low down, so BCR hand-milled an aluminum plate to bolt the assembly to. In a bid to use as few original parts as possible, the crew ditched the front fender too. They replaced it with a one-off, aluminum item. To add extra clearance, it was designed as a two-piece unit that attaches to either side of the fork brace, rather than mounting underneath it. It’s the tank that is the pièce de résistance, though. 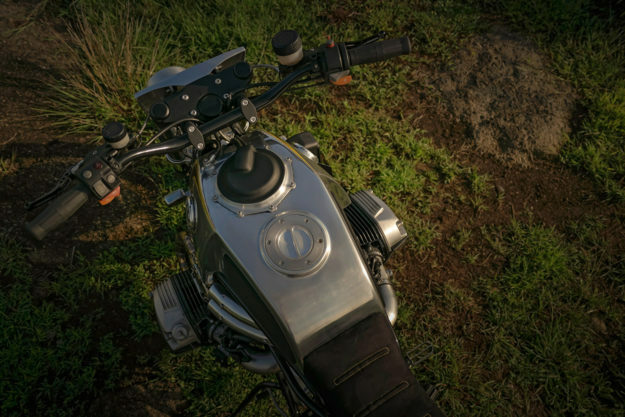 “The shape of the tank is always what dictates the overall look and attitude of our bikes,” explains Benjie. 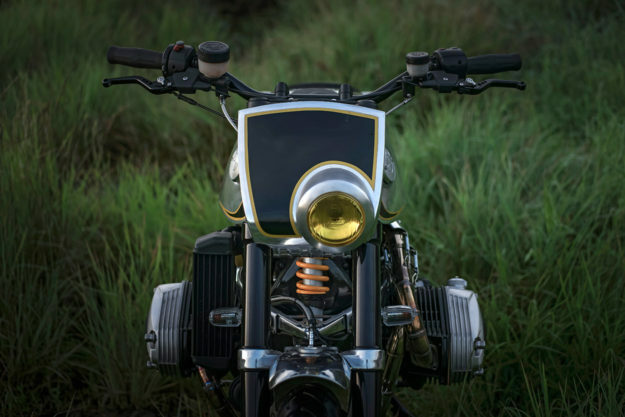 “As a homage to the old school, we decided to shape the tank similarly to the toaster tanks of the 70s BMW airheads. We added knee indents, machined rubber knee pads, and put tank badges on the sides.” The finish is BCR’s signature look: raw metal, with black scallops and gold pin stripes. Rather than hide away the stock fuel pump, BCR decided to make it a feature. “It was perfect for the post-apocalyptic look that we were after,” says Benjie. It now sits up top, with the hoses and wires exposed. There’s also a curvy new seat, covered in Alcantara, with a neat bead stitch across it. The rear light housing and fender are hand-shaped aluminum units. 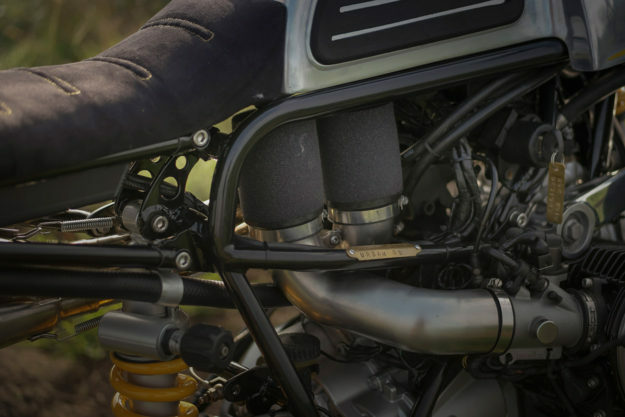 The overall aesthetic of the build called for an aggressive exhaust—so BCR designed a high-riding two-into-two system with exposed welds. The pipes were routed tight for maximum leg clearance, and finished off with heat shields. 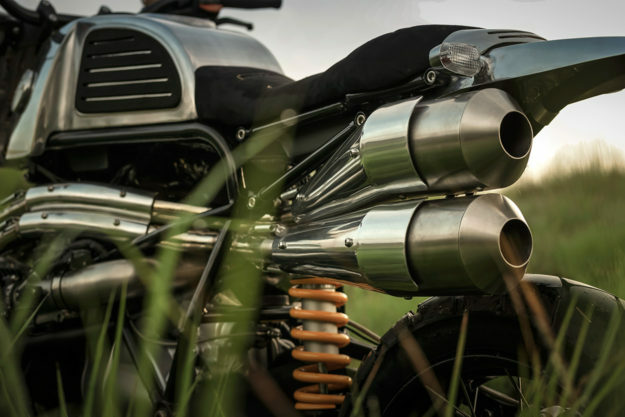 The mufflers themselves were glass-packed, and shaped to mimic dirt tracker exhausts of the 70s. On the mechanical side, BCR gave the engine a basic rebuild and reseal, replacing the top end gaskets to keep everything airtight. They replaced the clutch too, and then realized that they wanted to ditch the original air box. There isn’t a spot on the GS that hasn’t been nipped or tucked in some way. The oil cooler—previously hiding inside bodywork—has been relocated, and now has a small air deflector to keep heat off the rider’s leg. The foot pegs and mounts are custom, and a linkage-less pedal now controls the relocated rear brake master cylinder. There’s also a new front engine cover, made from carbon fiber with the original plastic unit used as a mold. Tearing into a modern GS was a bold move, but it’s paid off. 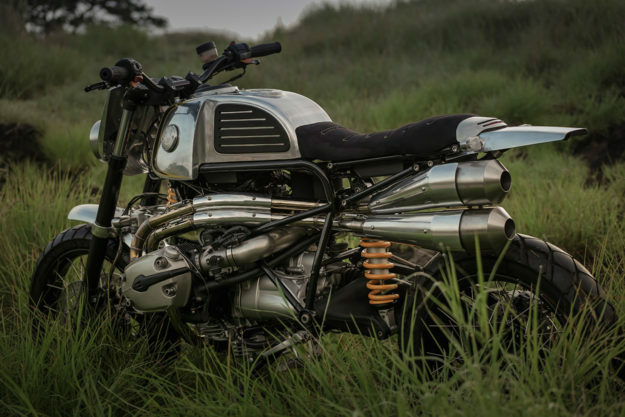 The New Jersey shop has given this BMW an otherworldly vibe that makes us want to ride it into the wasteland.